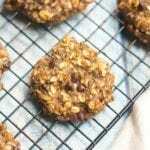 Healthy Banana Oatmeal Breakfast Cookies are the best way to start your day. They're easy to make & packed with simple ingredients, healthy fats + protein. Bake at 350 for 10-15 minutes, or until cookies are a light brown on the edges. Allow cookies to cool + store in an airtight container in refrigerator.